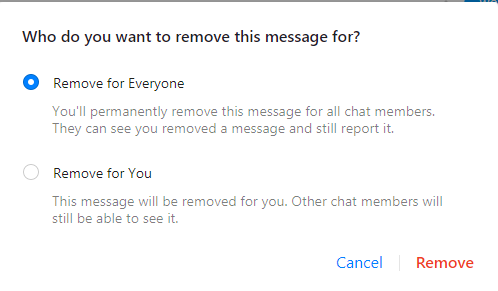 If you want to remove messages for everyone in Facebook or you want to Unsend a Facebook Message like how you can delete messages on WhatsApp for both side. So you are on a right article in which I will show you guys "How to Delete Facebook Messenger Messages (Unsend a Facebook Message)". If you’ve used WhatsApp, you will know about the "delete sent messages" feature on WhatsApp for everyone the option can be last for 10 minutes after which you won't be able to delete the sent message. The same feature is also introduced on Facebook. 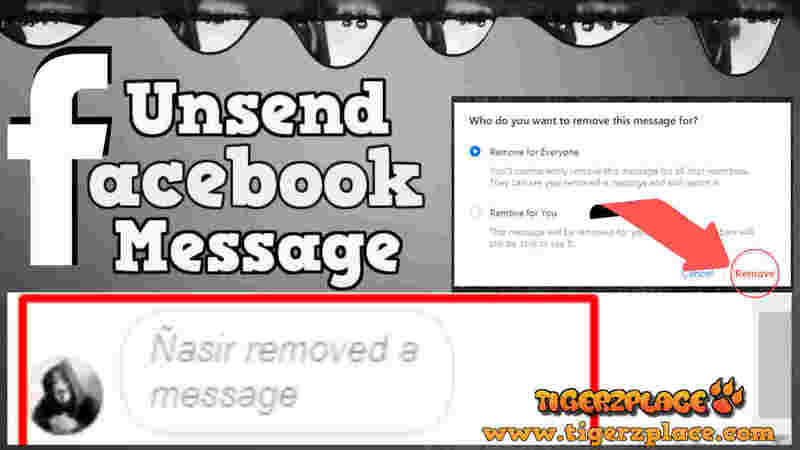 The method is now quite old which was released a couple of months ago enabling Android and Iphone users to Delete Facebook Messenger Messages(Unsend a Facebook Message). Well that's just a quick overview how this method delete Facebook Messenger Messages or we can Unsend a Facebook Message will work. I wasn't publishing this post as it was already published and was quite one easy method with few steps. But couple of days ago I noticed that the option can also be used on other devices other than just Android or Iphone. So I thought to publish the other method as well. So as I said it work the same as WhatsApp Delete Message works. Now here the thing is that the feature is fully working for Android & Iphone Facebook Apps but partially for Web Browsers. I'll mention both methods how you can Delete Facebook Messenger Messages both in mobile phones and also on CPU. Also one more thing that this method works for messages which are sent to some other user or in group chat. For pages I have checked the method but once you send message to a Page, you will not be able to delete that message. So yeah keep that in mind that you can't Unsend a Facebook Message which is sent to a page. Tap and hold the message you want to delete for both sides (mean you want to unsend message on facbeook). & Confirm removal of the message from Facebook Messenger. 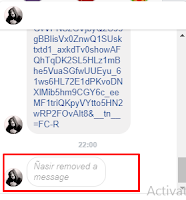 Once the message is deleted from facebook, one left message box will appear in the message thread, which will say “You removed a message.” (Same as you notice it in WhatsApp). So that's how you delete facebook messenger messages. 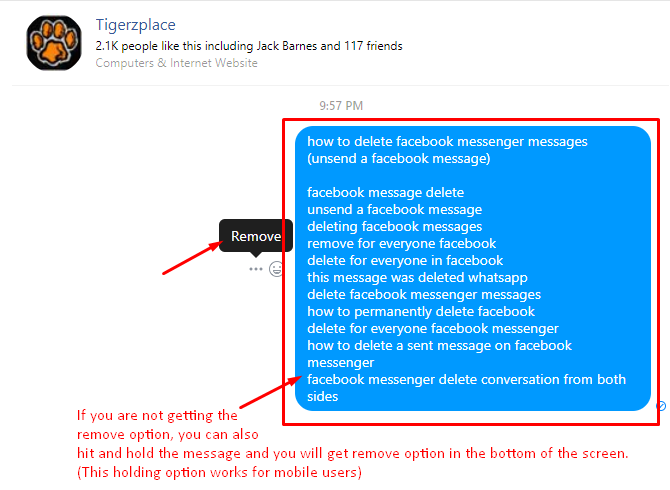 Further I'll now show you how to delete facebook messenger messages or unsend a facebook message using Web Browser. Once you are there, you will get all the messages for each user as a messenger app. Then just visit to the chat in which you want to unsend a facebook message. Now here in web mode, you don't need to tap or hold the message but instead you will find three dots next to each message (...) like this. Just click on it which will open a small dialogue box in which "Remove" option will be listed. A box will pop up asking what you want to remove the message for. You’ll be given the ability to do one of three options. Delete the message from just your inbox by selecting “Remove for You” option. 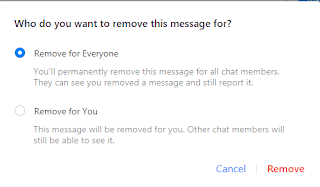 Delete the message for everyone in the messenger using “Remove for Everyone” option. Cancel the message removal if you clicked the button by mistake. 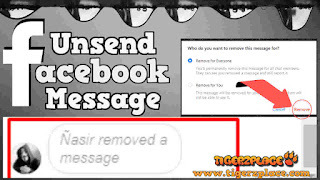 Once you select the option, it will delete message from facebook messenger complete on both side & you will be left with a blank message stating "You removed a message"
That's all for this method 'how to unsend a facebook message'. Hope you will find this method working. NOTE: Make sure you use updated Web Browser.